FREE 10 mins consultation prior to all appointments. Appts: Contact reception on 020 8293 1116.. To support weight-loss, skin care, digestive health and more… Inc. Treatment Plan, Food Schedule with Daily Menus and wholefood recipes to make from scratch in under 20 mins. Address food intolerances and allergies with antioxidant rich foods with healing and anti-ageing effects. Nutritional Therapist and Wellbeing Coach. With enormous thanks extended to the immensely talented Anne-Marie at Lewisham Gardens for her beautiful designs on the food-nature walk posters. 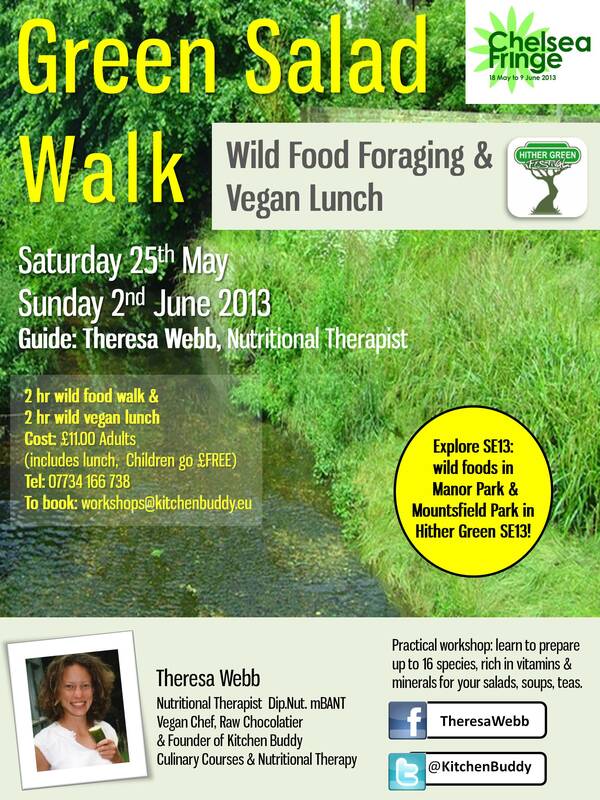 Wild Food walk lead by Theresa Webb Dip.Nut mBANT Nutritional Therapist. Explore and discover wild foods in Hither Green and then learn how to prepare and eat them. Learn more about the nutritional benefits and medicinal properties of over a dozen local species as well as their uses in soups, teas, salads and skin care.